Have you ever wondered how Swansea City got on a particular day in history, wondered which league they played in or which players scored the goals and for which manager? Well now you can find out exactly what happened when the Swans played on 22nd March. 3 years ago in 2014 – Despite goals from Wilfried Bony and Ashley Williams, Garry Monk’s Swans lost 3-2 at Everton in the Premier League. Yet again Monk was left to rue costly individual errors, none more so than Chico Flores clumsy challenge on Ross Barclay, which handed Martinez’s men the lead at Goodison Park. The defeat meant the Swans had now gone 5 league games without a win and were only 4 points off the relegation places as they dropped to 15th place. 14 years ago in 2003 – Brian Flynn’s bottom of the table Swans drew 2-2 at Kidderminster Harriers in Nationwide Football League Division Three. First half goals from Lenny Johnrose and Roberto Martinez ensured a share of the spoils in front of the 3,172 crowd. 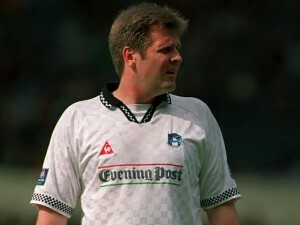 20 years ago in 1997 – A penalty from player-manager Jan Molby helped the Swans earn a 1-1 draw with Darlington at the Vetch Field in Nationwide Football League Division Three. The result meant that Swansea City remained in 4th place in the league table in front of the 4,176 faithful. 23 years ago in 1994 – Despite losing 1 nil at Wycombe Wonderers in this Autoglass Trophy Final Southern Section 2nd leg game, Frank Burrows’ men were heading to the Autoglass Trophy Final at Wembley, thanks to an 3-2 aggregate win. The Swans managed to hang-on to their slender goal advantage in front of the 6,710 crowd, despite going behind after just 29 minutes. 28 years ago in 1989 – The Swans beat Huddersfield Town 1-0 at the Vetch Field in Barclays League Division Three. A 3rd minute Robbie James penalty was enough to ensure all three points for Ian Evans team and send the 4,075 crowd home happy. 31 years ago in 1986 – Despite first-half goals from Phil Williams and Roger Gibbins, the Swans gave away a two goal advantage against high-flying Gillingham at the Vetch Field, as this Canon League Division Three game ended in a 2-2 draw. The result meant the Swans remained in 23rd place in the table under the stewardship of caretaker manager Tommy Hutchinson. 37 years ago in 1980 – The Swans earned a useful point in a 1-1 draw at Sunderland in the Football League Second Division. David Giles was the Swans scorer in front the 25,175 Roker Park crowd.